Major. Run-up of 67 m (220 ft) at Shoup Bay, Alaska. 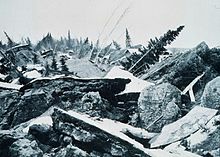 Lasting four minutes and thirty-eight seconds, the magnitude 9.2 megathrust earthquake remains the most powerful earthquake recorded in North American history, and the second most powerful earthquake recorded in world history. Six hundred miles (970 km) of fault ruptured at once and moved up to 60 ft (18 m), releasing about 500 years of stress buildup. Soil liquefaction, fissures, landslides, and other ground failures caused major structural damage in several communities and much damage to property. Anchorage sustained great destruction or damage to many inadequately earthquake-engineered houses, buildings, and infrastructure (paved streets, sidewalks, water and sewer mains, electrical systems, and other man-made equipment), particularly in the several landslide zones along Knik Arm. Two hundred miles (320 km) southwest, some areas near Kodiak were permanently raised by 30 feet (9 m). Southeast of Anchorage, areas around the head of Turnagain Arm near Girdwood and Portage dropped as much as 8 feet (2.4 m), requiring reconstruction and fill to raise the Seward Highway above the new high tide mark. In Prince William Sound, Port Valdez suffered a massive underwater landslide, resulting in the deaths of 32 people between the collapse of the Valdez city harbor and docks, and inside the ship that was docked there at the time. Nearby, a 27-foot (8.2 m) tsunami destroyed the village of Chenega, killing 23 of the 68 people who lived there; survivors out-ran the wave, climbing to high ground. Post-quake tsunamis severely affected Whittier, Seward, Kodiak, and other Alaskan communities, as well as people and property in British Columbia, Washington, Oregon, and California. Tsunamis also caused damage in Hawaii and Japan. Evidence of motion directly related to the earthquake was also reported from Florida and Texas. On March 27, 1964, at 5:36 p.m. AKST (3:36 a.m. UTC), a fault between the Pacific and North American plates ruptured near College Fjord in Prince William Sound. The epicenter of the earthquake was 12.4 mi (20 km) north of Prince William Sound, 78 miles (125 km) east of Anchorage and 40 miles (64 km) west of Valdez. The focus occurred at a depth of approximately 15.5 mi (25 km). 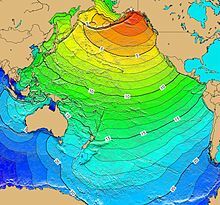 Ocean floor shifts created large tsunamis (up to 220 feet (67 m) in height), which resulted in many of the deaths and much of the property damage. Large rockslides were also caused, resulting in great property damage. Vertical displacement of up to 38 feet (11.5 m) occurred, affecting an area of 100,000 square miles (260,000 km2) within Alaska. Calculated travel time map for the tectonic tsunami produced by the 1964 Prince William Sound earthquake in Alaska. Tsunami Travel Times computed using Tsunami Travel Times  software v3.1 (P. Wessel). The map does not show the height or strength of the waves, only the calculated travel times. Blue: 15- to 21-hour arrival times. The 5-story JCPenney department store in Anchorage in 1964, following the earthquake. One house on W. 10th Avenue suffered peripheral damage, but only one block away the recently completed (and still unoccupied) Four Seasons Building on Ninth Avenue collapsed completely, with the concrete elevator shafts sticking up out of the rubble like a seesaw. The hamlets of Girdwood and Portage, located 30 and 40 mi (48 and 64 km) southeast of central Anchorage on the Turnagain Arm, were destroyed by subsidence and subsequent tidal action. Girdwood was relocated inland and Portage was abandoned. About 20 miles (32 km) of the Seward Highway sank below the high-water mark of Turnagain Arm; the highway and its bridges were raised and rebuilt in 1964–66. ^ USGS. "M9.2 - The Great Alaska Earthquake and Tsunami of March 27, 1964". United States Geological Survey. ^ USC, Tsunami Research Group. 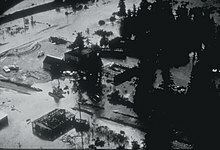 "1964 Alaskan Tsunami". University of Southern California. Archived from the original on 8 May 2015. Retrieved 18 July 2015. ^ "Geoware Tsunami Products". www.geoware-online.com. Retrieved 2018-06-21. ^ a b "Getting Ready to Rumble", Richard Conniff, The Wall Street Journal, August 26, 2017. 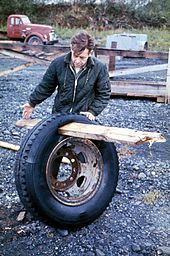 ^ The Great Alaskan Earthquake & Tsunamis of 1964, by the National Oceanic and Atmospheric Administration. Accessed 2009-06-23. Archived 2009-06-25. ^ "Tsunami generated by Good Friday quake devastated Oregon Coast 50 years ago Thursday". OregonLive.com. Retrieved 2018-07-27. ^ Sozen, Mete A. and N. Norby Nielsen, 1973: Analysis of the failure of the Anchorage International Airport control tower. The great Alaska earthquake of 1964, Volume 3, Part 2, National Research Council (U.S.). Committee on the Alaska Earthquake, National Academy of Sciences, ISBN 0-309-01606-1. ^ "Tsunami runups in Canada in 1964". National Oceanic and Atmospheric Administration. ^ "A brief history of the Canadian dollar". Retrieved 2018-01-11. ^ Oregon's pioneer spirit. Statesman Journal, December 26, 1999. ^ "Tsunami runups in Freeport". National Oceanic and Atmospheric Administration. ^ Fountain, Henry (2017). The Great Quake: How the biggest earthquake in North America changed our understanding of the planet. New York: Crown. p. 145. ^ "Ruth Anne Marie Schmidt Ph.D." Alaska Women's Hall of Fame. 2015. Retrieved November 23, 2015. ^ Saucier, Heather (April 2014). "PROWESS Honors Historic Earthquake Survivor". American Association of Petroleum Geologists. Retrieved July 31, 2018. National Research Council, Committee On The Alaska Earthquake (1971–73). 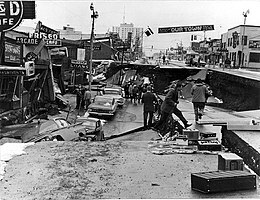 The Great Alaska Earthquake Of 1964. Washington: National Academy of Sciences. Wikimedia Commons has media related to Good Friday Earthquake.